Takalani Madzivhandila, President of SAIF signed the constitution of the newly formed BRICS Foundry Association on 10 September at the 5th BRICS Foundry Forum held in Nizhny Nogorod in Russia. 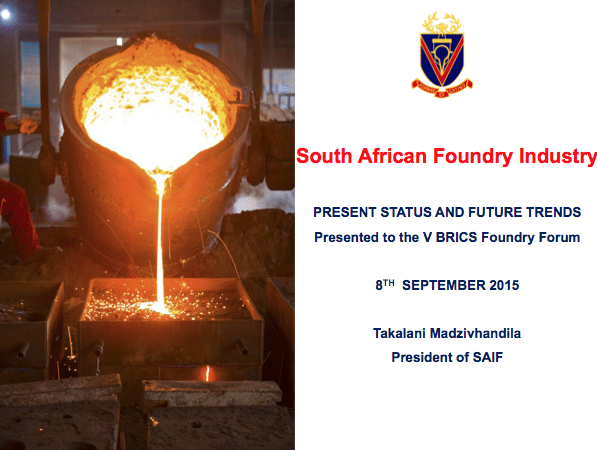 The South African foundry industry was represented by Takalani, Janley Kotze (Vice-President) and John Davies (CEO). The South African delegation joined presidents of the the Brazil Foundry Association (ABIFA), Mr Remo De Simone and The Russian Association of Foundrymen (RAF), Prof Ivan Dibrov, the Vice-President of the China Foundry Association (CFA), Mr Zhang Libo and the Past President of The Institute of Indian Foundrymen (IIF) Mr Subudh, Panchal at this ceremony aimed at strengthening the relationship and co-operation between the foundry industry representatives of the BRICS member countries. The BRICS Foundry Association is a non-profit organisation focusing on the global foundry development, enhancing the foundry technology among BRICS countries, promoting communication and cooperation, education and training, and promoting the sustainable development of the foundry industry of these countries. 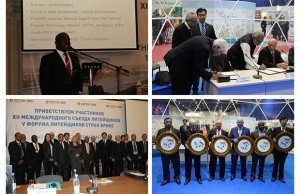 “We are grateful and privileged to be a member of the BRICS foundry association and look forward to enhancing the spirit of co-operation for the benefit of The Metal Casting Industry in South Africa, as well as the other BRICS countries” said Takalani at the ceremony. South Africa was the host to the 3rd BRICS Foundry Forum held in 2013 and it was agreed at this event that the country will again host the forum in March 2017. The forum will be held concurrent to the 2nd Metal Castings Conference and the World Foundry Organisation Technical Forum. This annual event is hosted for SAIF Members ONLY and allows for suppliers to the industry as well as foundries to engage with their customers while supporting the institute. Members are encouraged to contact Marina Biljon at the SAIF office as soon as possible to secure a booking or to confirm sponsorship for the event. We are very appreciative of all donations of spot prizes and special prizes received for the day. Bookings are limited to three (3) fourballs per company and must be submitted to our offices by no later than 23 October 2015. The 2nd Metal Casting Conference (MCC) will be hosted concurrently with the World Foundry Organization (WFO) Technical Forum from 14 - 17 March 2017 in Gauteng. The NFTN in partnership with the South African Institute of Foundrymen (SAIF) and the Metal Castings Technology Station (MCTS) are the conference hosts. Foundrymen, industry suppliers, casting buyers and all other stakeholders in the domestic metal casting industry will benefit from this prestigious international event. The event promises to provide a unique forum to share the latest international and national technological developments driving competitive advantage in the foundry industry, as well as an invaluable opportunity to network with foundry experts from all over the world. The conference hosts are currently engaging with academic institutions and industry bodies to form partnerships and sponsorship opportunities will be available soon.